A single crow will entertain. A thousand dazzle. 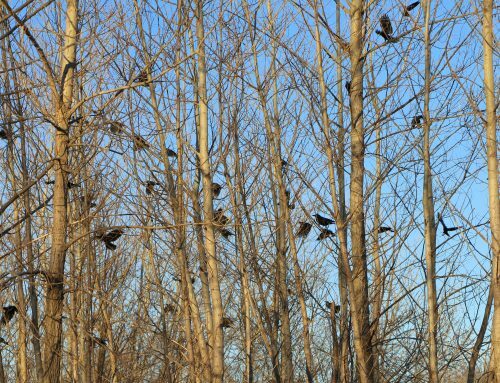 Twenty-six thousand cawing crows blanketing trees nightly in winter along the Merrimack River in a single Lawrence locale fascinate. And get folks a-thinking. Crow wonder and mystery are the stuff of art at 56 Island St. in Lawrence. The Essex Art Center will host three exhibitions, or crow shows, through March 15. This is the first time that the director recalls the center devoting all of its galleries to a lone subject. Take a bow, you good crows. The shows include a photography exhibit by five professionals, a community exhibit of paintings and pastels by area and regional artists, and a main show built around an artist’s video and still images.All are welcome to Friday’s reception. 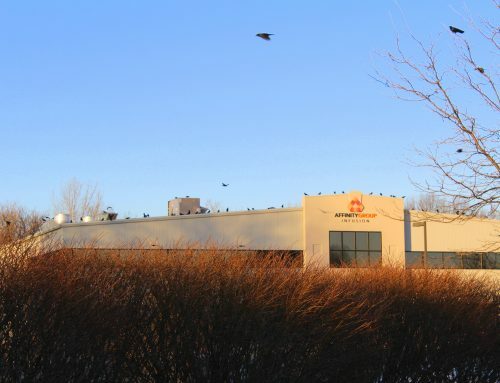 The crows will be roosting several hundred yards away under the Duck Bridge by the New Balance complex. Bird photographer and crow enthusiast Craig Gibson, the Roman Catholic chaplain at Lawrence General Hospital, has been observing and photographing the Lawtown birds regularly since 2017. That was when original crow patrol members, Dana Duxbury-Fox, and her husband, Bob Fox, invited him to go crowing with them. He’s been out about 100 times in the past year or so, seeing the crows alight at daybreak on their way to feeding grounds distant from the city, and then seeing them return around sunset. “It’s a bit staggering, amazing — a sense of wonder — when you see 10, 20, 25,000 crows in the air,” Gibson said, sitting in the Essex Art Center gallery before the show went up. He hopes the reception and exhibition — a fledgling crow festival, really — instills a deeper appreciation for this local phenomenon. Cathy McLaurin, the art center’s director, said that she and others were on board when Gibson pitched the crow roost celebration. For centuries, crows have been the subject of myth and captured artists’ attention. Andover artist Karen Van Welden-Herman, an avid bird watcher, has a studio below Essex Art and has been intrigued by the Lawrence crows since she first saw them, years ago. The spectacle fired her imagination and a pastel called “Ingathering,” featured on the Community Artist Wall. It shows a crow in flight and a stationary crow, and contemplates how things come together — such as a community of birds. She hopes that the shows encourage people to see the roosting crows for themselves. The community exhibit also includes works by others familiar with local crows, including Lawrence High School art teacher Eric Allshouse. One of his pieces shows a skull with a crow across the eyes. Crows symbolize different meanings in different cultures and at different times — from omens and death to mystery and intelligence. The show in the Elizabeth A. Beland Gallery, by Dennis Hlynsky, of Providence, Rhode Island, is called “Murders and Other Flying Things.” The “murders” in the title is a reference to the collective noun for a group of crows. “That show considers how a word or name for something can embody the way that thing makes us feel,” McLaurin said. 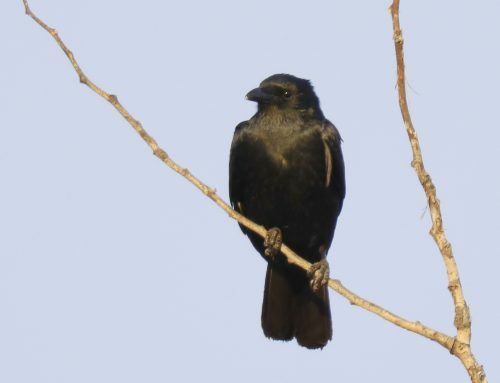 As far as the Lawrence crows go, people who study them do not know why they roost in such large numbers. 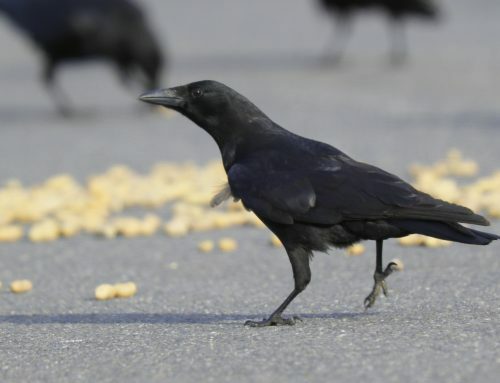 Some experts consider it an intelligence-gathering opportunity, to share information about feeding grounds, or a place for young crows to meet future mates. Cities are slightly warmer places to congregate, so that might be drawing them, as well. Some Essex Art people call it a big crow pajama party. The birds roost in the city, but feed elsewhere. Oriental bittersweet makes up most of the birds’ diet, Gibson said. Crows are family-oriented, he said. The males and females remain together, and the birds from prior years will stick around and help rear the newcomers. 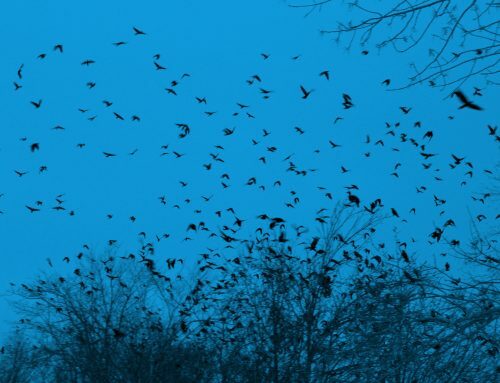 The Lawrence crows — American crows and a much smaller number of fish crows — have been leaving their nests and coming to Lawrence for the winter roost since at least 1989. Lawrence isn’t the only city that attracts large crow roosts. Some cities discourage the birds by setting off noisemakers to scare them off. Gibson hopes that the art shows are the beginning of an annual crow celebration. The roost fascination seems to be taking root. A Mass Audubon tour and talk is planned for later this month, and similar activities are slated for February through a joint event by the Merrimack River Watershed Council, Merrimack Valley Bird Club and Andover Village Improvement Society. Also underway is a Boys & Girls Club of Lawrence creative writing contest on the winter crow roost, and another writing contest is in the works through Northern Essex Community College in Lawrence. Guided walks and high school and college biology programs are on the drawing board, as well. Gibson said that the more time people spend around crows, the more appreciation they have for the birds. The harmony they exhibit in family units roosting in the thousands sparks mystery and wonder.